James Cann Choate , Jr.
[S969] Source: E-mail dated 21 December 2002 from Kristi LaVonne Tabb Hanson (e-mail address). Her address is 42478 Bayou Narcisse Road, Gonzales, LA 70737-7660. Phone: 225-644-7356. Adolph was born in 1881. He married Juawice Tabb at Lake Village, Chicot County, Arkansas, on 13 May 1952.1 Adolph L. Mills was buried in 1965. Cornelia was born at Mississippi on 27 November 1892. She married Arthur Owen McDade in 1915. Cornelia Ethel Tabb died on 12 September 1971 at Sunflower County, Mississippi, at age 78. She was buried after 12 September 1971 at Linn Baptist Church Cemetery, Linn, Sunflower County, Mississippi. 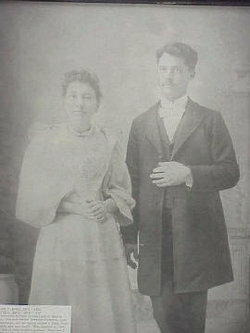 Robert was born at Early County, Georgia, on 14 February 1874.1 He married Selma Eola Sanders on 9 January 1893. Robert Pinkney Phillips died on 5 December 1941 at age 67. He was buried after 5 December 1941 at Live Oak Freewill Baptist Church Cemetery, Milford, Baker County, Georgia.